I bought a framed copy of "Merlin" (I used to call him Copernicus but decided that was too rooted in reality to suit him) in the late 90s. My copy is 90cm x 60cm and the colours are so intense and gorgeous, and the content so engrossing, that I had to hang it at the foot of my bed so I could gaze at it in comfort! And the perfect musical accompaniment is the wild and stormy "In The House of the Mountain King" from the Peer Gynt Suite. I found a jigsaw puzzle of your painting on Ebay. It was unavailable elsewhere. I was charmed by the mix of fantasy and science, and the search for truth, in the painting. I have seen this as a puzzle, but I am not really a puzzle person. I would really like to see the details of this artwork in a print like Merlin's Oak. 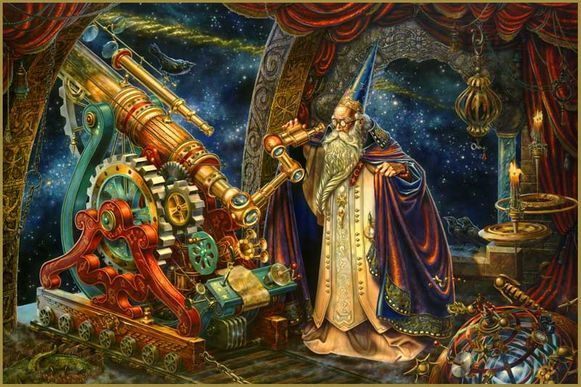 I am fascinated by the telescope and other paraphernalia in the wizard's observatory and want to see it up close. So excited to find the original artist. I've been looking for more of your artwork, and I don't know why it took me so long to figure out to do a reverse image search. This image is beautiful and I'm happy to have found even more of your artwork!